I wanted to let our customers know that we've processed a few of our organic, "soy-free" pasture-raised pigs, and are now taking orders for chops, bacon, sausages, ribs, hams, and more. These pork products are from healthy, happy outdoor pigs --- and they are delicious. As you may know, our certified organic pigs never see the inside of a barn --- they are raised outside, in the sunlight, on our grassy pastures --- and are 100% soy-free. Why soy-free? Soy has become increasingly controversial, with some experts questioning its purported health benefits, and others even suggesting it's unsafe. Although many are unaware of it, soy has become a key ingredient in livestock feed because it promotes fast growth. It's difficult (maybe impossible) to find pork in the lower mainland of BC that has not been fed high concentrations of soy. That's true of all pork, whether it's conventional, "natural", or certified organic. Yes, our pigs grow more slowly than barn-raised "factory" pigs. But we feel the benefits to us AND the pigs are worth it. Healthy, happy pigs produce healthy, delicious meat. 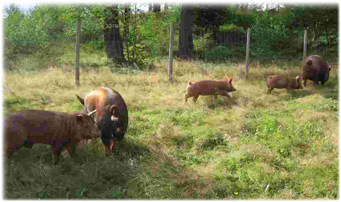 As far as we know, we're the only ones in the lower mainland of BC who are raising soy-free certified organic pastured pork, so if you're interested, please place your order soon, because some products may sell out (you can place your order here). Thanks for supporting local, certified-organic family farms.